For other people named Jeffrey Cox, see Jeffrey Cox (disambiguation). 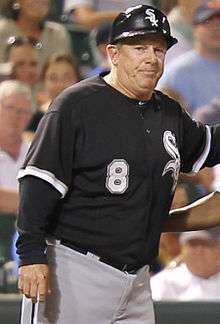 Jeffrey Lindon Cox (born November 9, 1955 in Los Angeles, California) is a former Major League Baseball third base coach for the Chicago White Sox. He is currently a baserunning specialist for the Detroit Tigers. Previously, Cox was a second baseman for the Oakland Athletics during the 1980 and 1981 seasons. He batted and threw right-handed. Cox has completed three seasons with the Chicago White Sox as a third base coach. On January 21, 2013 the Tigers hired Jeff Cox as a baserunning consultant. Cox was the Florida Marlins bench coach, bullpen coach, then eventually the third base coach and in 2003 when they won the World Series. Cox was the third base coach and infield instructor for the Pittsburgh Pirates. In a 61-game career, Cox was a .213 hitter (36-for-169) with 20 runs and nine RBI without home runs. Jeff Cox is single father and has one daughter named Kimberly. He graduated in 1973 from South Hills High School located in West Covina, California. In high school, Cox was a three-sport athlete lettering in baseball, basketball, and cross-country. His senior year in high school he was named to the California Interscholastic Federation first team in baseball and basketball. Cox later attended Manatee Junior College in Bradenton, Florida while also playing at the Royals Baseball Academy. Cox played two years of basketball at Mount San Antonio College in Walnut, California and also attended Cal Poly-Pomona. ↑ "Manager and Coaches Whitesox". White Sox. Retrieved 2 July 2012.